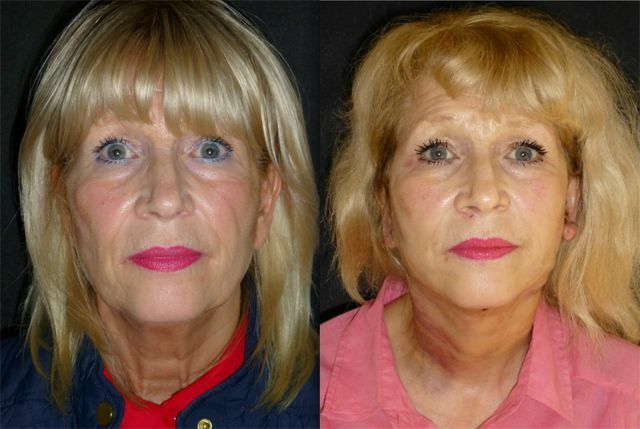 Kathy came to see me with the usual concerns of mid and lower facial ageing. 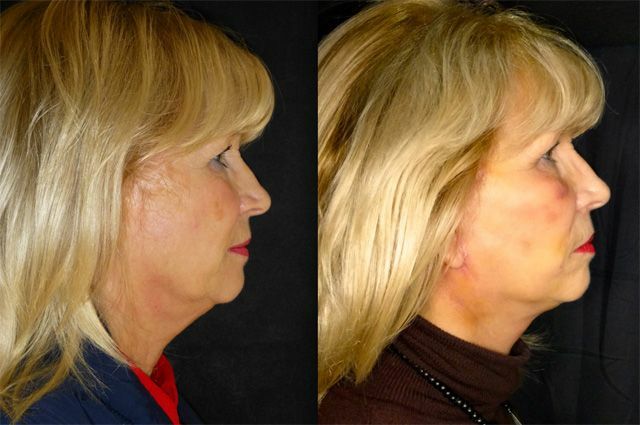 Jowls, loss of neck definition and a hollow mid face. 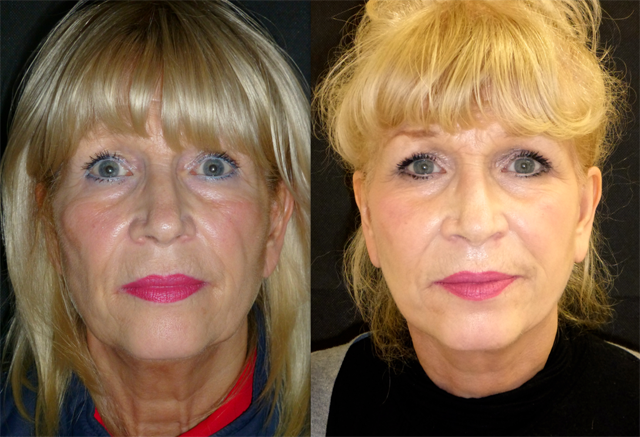 She underwent a facelift and necklift with liposuction of the jowls, jaw and under chin all under local anaesthetic. 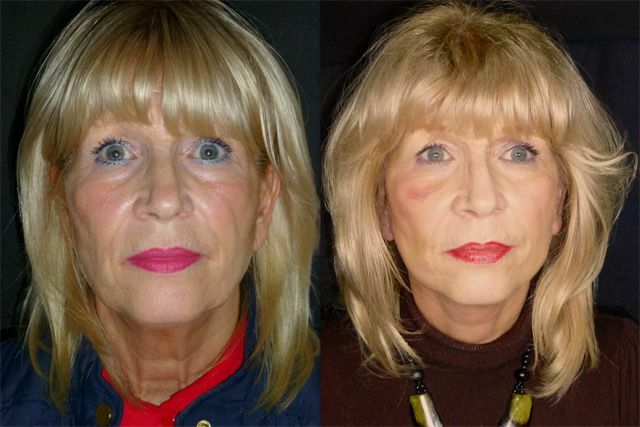 This is Kathy, the morning after her facelift surgery by Dominic Bray. 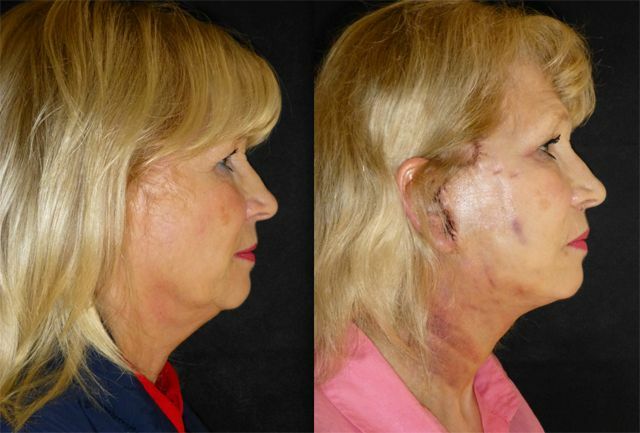 She really has very little facial bruising despite quite significant liposuction to the jowls and neck. I believe this to be due to the placement of her own blood plasma stem cells that I place under the facial flaps before stitching up. She has undergone manual lymphatic drainage and had her hair washed. 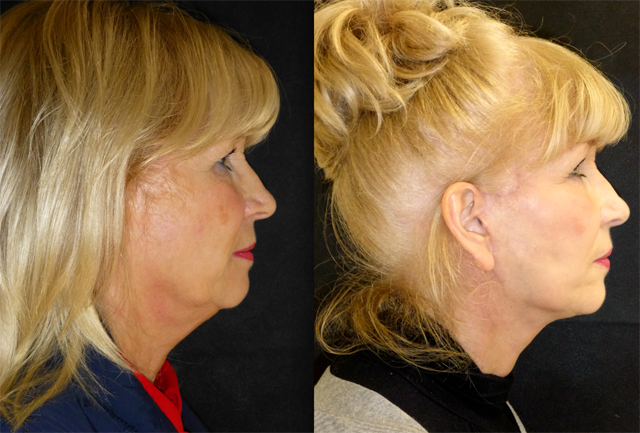 The definition of her jawline is already apparent and with her newly volumised mid face she looks refreshed and rejuvenated. So much so, she insisted on putting on some lipstick for her photos! Poor Kathy, despite being a brilliant patient, has had a torrid time. Whilst her surgery was uncomplicated and she recovered quickly, she has had quite a lot of bruising. There is nothing in her medical history to suggest this predisposition but thankfully all her bruises are now fading. I have also drained a small seroma (collection of straw coloured tissue fluid) and this swelling is now settling. Despite this small setback her result won't be compromised in any way. Her jawline and neck improvement are already impressive and will get even better as things settle. 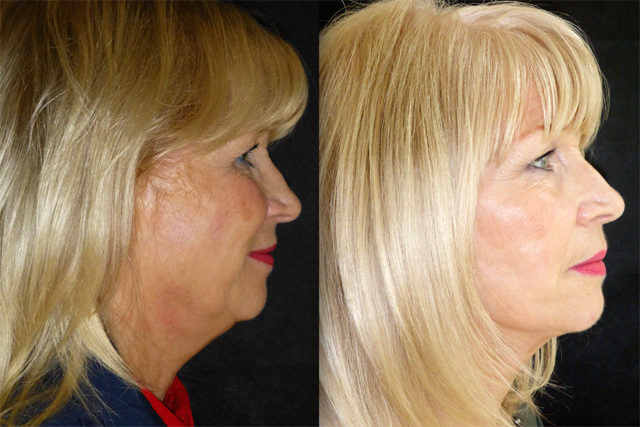 2 months following face and neck lift and jawline and sub mental liposuction, Kathy is now well healed. She does have a small area of lumpiness and skin tethering under her left ear (visible in the left 3/4 view) which I have injected with anti-inflammatory medication to help it soften. This is working nicely and I have no doubt that in a few more weeks all will settle. We can see how her incisions have healed in the same photo. 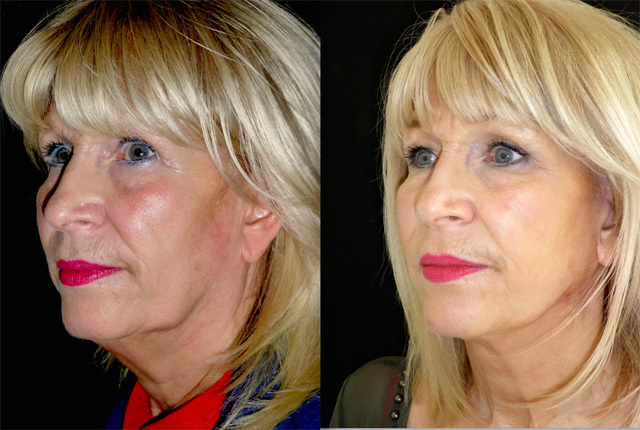 At 8 weeks after surgery it is very early in the day for scar maturation and over the coming months these will become barely visible. 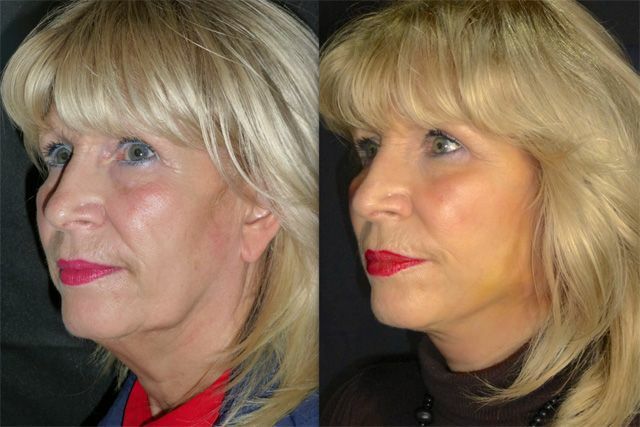 Her face looks less gaunt, she has a beautiful neck chin line and volumous youthful cheeks. Kathy is now nearly 6 months following surgery ( five and a bit to be precise! 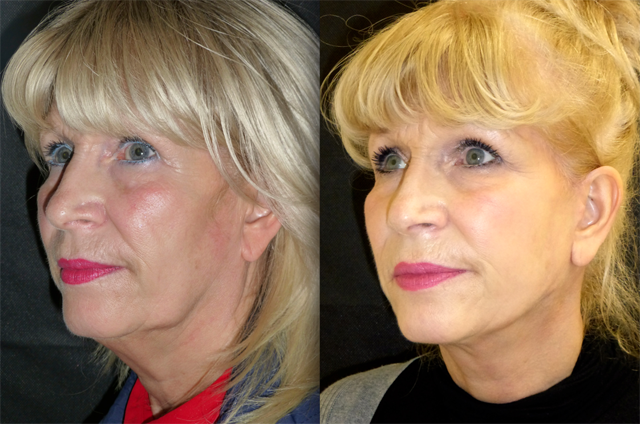 ), the area of lumpiness has completely softened, and the her skin is mobile over the area treated. 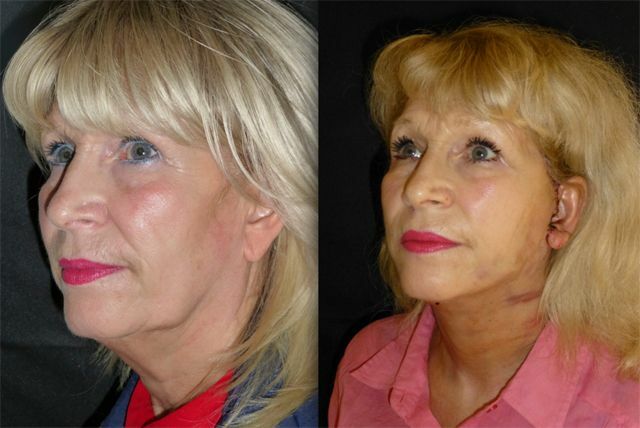 She has a few thread veins over the treated area which are easily eradicated with a pulse dye laser. 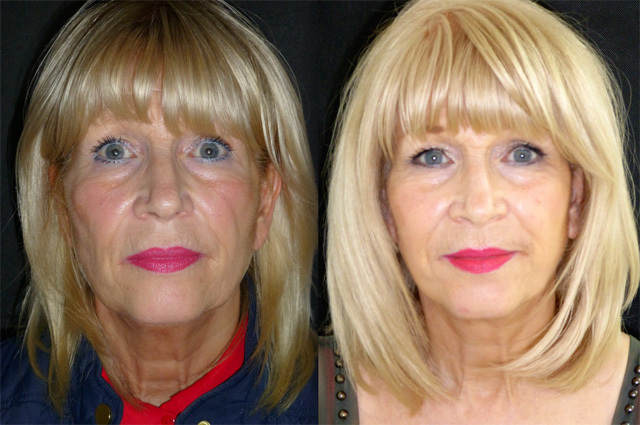 Her face has relaxed beautifully to a natural position and she looks brilliant.